Jun. 28, 2013 1:00 p.m. Looking at the devastation in several cities down south, Leduc County has been relatively lucky when it comes to flooding issues, but "relatively lucky" certainly does not mean unscathed. 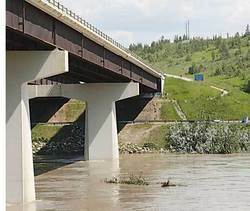 With all the rain that had been experienced in the Province, the North Saskatchewan has been running very high for a week at this point and spilled its banks over last weekend. The cresting point was expected at 4am on Sunday morning, June 23rd which appeared to be quite accurate with the worst of the flooding in Leduc County to be seen on Sunday morning. This caused quite a bit of concern for the Town of Devon who were hosting the Special Olympics. The Lion's Campground in Devon is in a low lying spot right along the river and town officials were keeping a close watch on the water levels as the park is a very popular camping spot and there were several families with athletes competing in the Special Olympics staying there for the weekend. Saturday afternoon saw the North Saskatchewan rising very quickly so the Town of Devon declared a State of Emergency and evacuated the campground. "There were almost 2000 people and 300 RV units in the park at that time," said Devon's Mayor Anita Fisher. "And we had them all out within three hours. Everyone was great and the Town had to move several units without the owners present but by the time we were done the water had advanced to cover almost half the park." An unidentified family member of one of the Special Olympics athletes that had been camping in the Lion's Park praised the Towns efforts. She said that everyone remained very calm and the move went very quickly and smoothly. Campers were moved to a large empty lot on high ground beside Riverside Baptist Church and all roads and trails accessing the river valley were blocked and guarded to prevent sightseers from getting too close to the fast flowing river and possibly endangering themselves. The speed and strength of the flow could easily be seen with fully grown evergreen trees, root balls still attached from where they had been uprooted, could regularly be seen floating down the river. Sadly, Devon's new bike park has been completely flooded, so damage will have to be estimated once the water recedes. At the highest point the river had completely swallowed the boat launch at Voyageur Park and covered half of the parking lot and almost reached the gazebo which at normal times sits several hundred feet back from the edge of the river. As of 4:20 Monday afternoon the State of Emergency in Devon remained in effect. Leduc County also had an eye on the water levels and evacuated four private homes within the County on Saturday just before midnight. Leduc County Peace Officers assisted the RCMP in evacuating the homes out by Genesee, three of which were occupied at the time. The families have been able to return home and it is not believed that the houses sustained any damage from the flooding. Two roadways in the area of Township Road 512 and Range Road 31 were also blockaded to prevent travel on compromised road surfaces due to the flooding but have since been reopened. With the rain not at an end yet, Leduc County has issued an advisement for people to stay well away from the North Saskatchewan River. There currently have been no flood water related emergencies or deaths in Leduc County and officials and emergency personnel would like to see it remain that way.